Few localities have yielded the number of diverse Pyrite crystal forms known to occur at Duff’s. Some of the crystal forms which can be readily observed at Duff’s Quarry, generally in combination, include trapezohedral, diploidal, octahedral, cubic, pyritohedral and dodecahedral. With this number of crystal forms, the possible combination of forms is extensive. 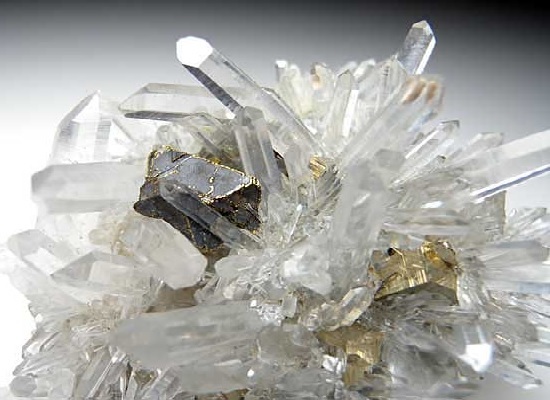 Many of the crystal forms observed at the locality are widespread throughout the quarry, while others have been very localized. However, crystals from the same pocket and often the same zone typically exhibit identical crystal form. The form may be distorted from crystal to crystal, but is usually easily identifiable. With few exceptions, multiple crystal forms are not seen in one pocket. Second generation octahedral Pyrite crystals have been observed, but these are quite rare and by no means the norm. Typically, most larger crystals occur in the lower part of the upper level, in a layer where pocket size is unfortunately smaller. Crystals found in the most heavily mineralized zones are generally no larger than 1 centimeter. Several, more in depth, studies have been conducted on the pyrite crystal forms from this locality. The following sections will explain and exhibit the more common of these forms. The R. Peter Richards article, listed in the references, provides a more detailed analysis of many of these crystal forms. As previously mentioned, the C.E. Duff and Son Inc. Quarry is one of the few localities where a multitude of pyrite crystal forms can be observed. To identify the forms which have been observed at this locality, it is first necessary to know and understand the seven basic geometric crystal forms of the pyritohedral symmetry class of the Isometric system. The most commonly observed unmodified crystal form is the Octahedron(C), which can be found as second generation crystals. The Octahedron(C), perhaps the second simplest Isometric form, is formed by “cutting” a single triangular face on each corner of the cube(A). Further, the Trisoctahedron(D) is formed by “adding” 3 triangular faces to each side of the Octahedron(C). Similarly, the Trapezohedron(G) is formed by “cutting” 3 triangular faces to each corner of the cube. The dodecahedron(B) is formed by cutting 12 quadrilateral sided faces between every two faces of the cube(A). The pyritohedron can be explained multiple ways. One way to produce the pyritohedron(E) is to construct 2 pentagonal faces on each of the 6 sides of the cube(A). Another way to produce this shape, similar to the dodecahedron(B), is by cutting 12 pentagonal faces between every two faces of the cube(A). The most common crystal form seen at the Duff Quarry is the Diploid(F), usually with Trapezohedral(G) modification. The Diploid(F) shape is formed by doubling the sides of the Pyritohedron(E). These geometric shapes dictate the crystal modifications which can be found at the C.E. Duff and Son Inc. Quarry. To the lower right is a table of Pyrite crystal forms found at the Duff quarry with face names and miller indices. It is highly unlikely that a pyrite crystal from this locality would have all of these faces, as certain faces are only found in combination with particluar dominant forms. For instance, the pyritohedron(f 310) is not found on Trapezohedral(M 311) crystals, but is common on Trapezohedral (N 211). Of the several Pyrite crystal forms known to exist at the C.E. Duff and Son Inc. quarry, the most common form is a diploid with trapezohedral modifications. 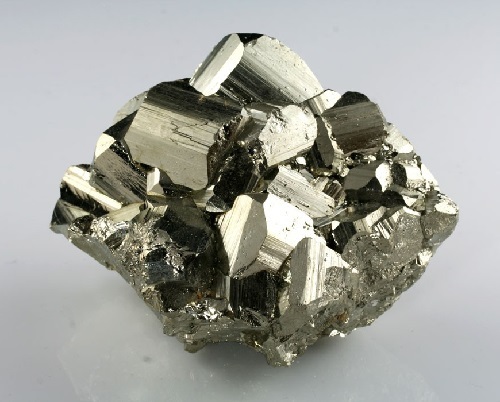 More than 90 percent of all Duff Pyrite crystals exhibit this crystal form. This form is generally widespread throughout the quarry. At first glance, these crystals look to be purely trapezohedral, a form not commonly observed in Pyrite. However, closer inspection reveals that this form is dominated by the diploid with slight trapezohedral modifications. Very few mineral species employ this crystal shape. Fig C. diploid modified by the trapezohedron smaller than the Diploidal faces, labeled D. This modification doubles the basic 24 sided diploid into a 48 sided shape. This new shape clearly exhibits both forms. With the addition of the Trapezohedral faces, the use of a Goniometer is no longer needed to identify and explain the crystal form. The photo to the right is an example of a typical modified diploid. Notice the clear trapezohedral modifications on this crystal, typical of most Duff Pyrite specimens. Over 80 percent of the diploidal crystals from this locality will exhibit this modification.